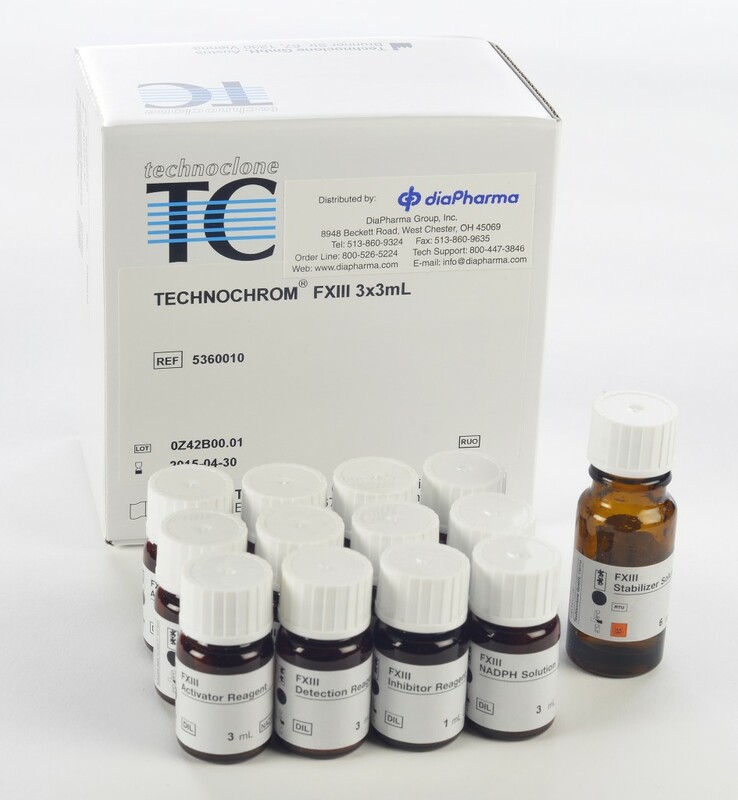 The Technochrom® FXIII kit is a reagent kit for the determination of blood coagulation Factor XIII (FXIII) activity for use in research to detect inherited or acquired FXIII deficiencies, abnormal FXIII with decreased activity and elevated FXIII level. Inherited FXIII deficiency is a rare, but severe bleeding diathesis with occasional wound healing impairment and in women with habitual abortion. Acquired FXIII deficiency due to an anti-FXIII autoantibody is also a very severe haemorrhagic diathesis. Consumption of FXIII in various diseases (malignant diseases, Chron disease HenochSchoenlein purpura, major surgery, etc…) usually results in moderate decrease of FXIII level. The assay can also be used for monitoring FXIII replacement therapy. When Factor XIII (FXIII) is activated it is transformed into an active transglutaminase (active FXIII [FXIIIa]). 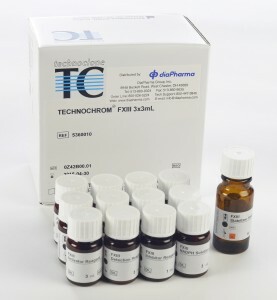 The determination of FXIII activity is based on the measurement of ammonia released during the transglutaminase reaction. FXIII present in the plasma sample is activated by thrombin and Ca2+. Fibrin formed from fibrinogen by thrombin accelerates this reaction. The polymerization of fibrin is prevented by a tetra peptide. The formed FXIIIa then cross-links the amine substrate glycine ethyl ester (GEE) to the glutamine residue of specific peptide substrate PI(1-12), and ammonia is released. In the indicator reaction the amount of released ammonia is monitored in a glutamate dehydrogenase catalyzed NADPH-dependent reaction. The consumption of NADPH is measured spectrophotometrically by the decrease of absorbance at 340 nm. Within a time window the decrease of absorbance is directly proportional to the FXIII activity. Factor XIII, also known as fibrin stabilizing factor, is a heterodimer (FXIII-A2B2) composed of two catalytic A-subunits and two carrier B-subunits. With thrombin cleavage of the A-subunit followed by dissociation of the B-subunit in the presence of calcium, the active site is exposed in the A-subunit. Activated FXIII (FXIIIa) is a transglutaminase that links or ligates the fibrous scaffold consisting of staggered fibrin units. Transglutaminase enzymes may be the earliest clotting enzymes in evolution, but, in vertebrate blood, conversion of FXIII to FXIIIa is tightly regulated. FXIIIa also crosslinks inhibitors of fibrinolysis to fibrin, such as alpha 2-antiplasmin. FXIIIa stabilizes the fibrin clot, and is essential for a properly functioning fibrin matrix. While studies elucidating the role of FXIII in clotting began in the 1940s, it wasn’t until 1966 that the first family with congenital FXIII deficiency was identified. As FXIII is essential for stabilizing the fibrin matrix, the loss of its activity would result in hemorrhage. FXIII deficiency is a very rare disease and most cases are due to mutations causing loss of the catalytic A subunits, but there are a few cases that result in deficiency due to a lack of the B carrier subunit. Congenital deficiency is an autosomal recessive disorder with an estimated incidence of around 1 in 2 million. Although clotting might be normal and thus many of the commonly used laboratory clotting tests remain normal (ie, prothrombin time [PT] and activated partial thromboplastin time [aPTT]), a hemorrhagic condition occurs because of the lack of cross-linking during coagulation. The severity of bleeding can range from very mild to life-threatening, and other conditions can result as well, such as habitual abortion in women. Cases of acquired FXIII deficiency also exist, and although also rare, inhibitors block FXIII activity by various mechanisms. Early diagnosis is critical as the onset can be sudden and severe. These patients require replacement of the FXIII. While reports vary on the FXIII levels that will cause symptoms, it is clear that very low FXIII levels are especially harmful. There is ongoing work on using recombinant FXIII, and at least 1 product is approved for use in the United States. It should be noted that FXIII has a wide range of protein targets, suggesting additional important roles in health and disease. Assays for FXIIIa coincide with the ongoing discovery that FXIII plays in the coagulation system. Urea-based assays played a role in understanding the need for this component in clot stabilization, as a formed clot was degraded in certain concentrations of urea without it. The urea-solubility assay subsequently was used to find the first family with FXIII deficiency. As the properties of the protein became clearer, assays based on its mechanism of assay were employed. It was recognized that small amines, such as glycine ethylester, played a role in fibrin stabilization, and that FXIIIa was specific towards amine substrates. Amine incorporation thus became a powerful tool in studying FXIIIa quantitation. When FXIIIa attaches glycine ethylester to a specific peptide substrate, ammonia is released. Various methods have been available for determining ammonia content and this has been utilized for many years in different assays. In these colorimetric assays, released ammonia is monitored in an NAD(P)H dependent glutamate dehydrogenase (GlDH) reaction. The decrease in absorbance measured at 340 nm over time is proportional to FXIIIa activity. NADH and NADPH absorb at 340 nm whereas NAD and NADP do not. The use of NADH or NADPH as a cofactor in the reaction varies depending on the assay. Spontaneous breakdown of NAD(P)H can occur but this can be compensated by using a reagent blank (using iodoacetamide). In addition, any compounds present in the sample that react with NAD(P)H under the conditions of this assay can give discrepant results for determination of the ammonia concentration. This side reaction can be as a result of the presence of other enzymes that utilize NADH; however, the use of NADPH as a cofactor can eliminate some of these interferences, as in the case of lactate dehydrogenase (LDH) which cannot utilize NADPH. With use of a blank and in an NADPH-dependent reaction, the sensitivity can be as low as 0.6%.